Orangutans are a Great Ape along with gorillas, chimpanzees and bonobos. Orangutan baby will cry when it is hungry and it will whimper when it is hurt. Baby orangutans can smile to their mothers. Orangutans are the only great apes species with a native habitat outside of Africa. Orangutans reproduce slowly. They have only 3 offspring in a lifetime. Native to Indonesia and Malaysia, orangutans are currently found in only the rainforests of Borneo and Sumatra. Orangutans live 35 years in the wild and up to 50 years in captivity. Sumatran orangutan – Lives on the island of Sumatra.The hair is longer and lighter-colored than the Bornean species. The adult male’s cheek pads, called flanges, form rigid half circles on the sides of his face and both males and females usually develop beards as they age. Bornean orangutan — Lives on the island of Borneo.Adult males have much larger flanges and a large throat pouch. The hair is shinier and the females rarely have any beard at all. Bornean orangutans are more heavy-set than the Sumatran species. The word orangutan comes from the Malay language and means ‘person of the forest‘ – from the words ‘orang’ meaning people and ‘hutan’ meaning forest. 9 months of pregnancy will end with one baby. They are tightly associated with their mothers and depend on them for food and protection. Young orangutans will stay with their mothers 7 years. Average life span in the wild is from 40 to 45 years and up to 59 years in captivity. Females average 114 centimeters (45 inches) tall and weigh around 37 kilograms (81.5 pounds). Males average 136 centimeters (54 inches) tall and weigh around 87 kilograms (191 pounds). Orangutans have an enormous arm span.A male orangutan has an arm span of about 2 meters (6.6 feet). Long, flowing, orange-reddish brown hair covers most of an orangutan’s gray skin. Orangutans spend most of their life in the trees, swinging confidently from branch to branch. Around the age of 15, male orangutans develop large cheek pads which attract females. These pads grow their entire life. They make their homes in these trees, find their food there, and build tree nests each night out of leaves and branches. Orangutans also use leafy branches to shelter themselves from rain and sun. When it rains very hard the orangutan makes an umbrella for himself out of big leaves. Orangutans are solitary animals. Males always live on their own while females live alone or with their offspring. Males and females spend time together only during mating season. Orangutans usually have little need to come down from the trees, as they are uniquely and very well adapted for their arboreal lifestyle. These cerebral primates forage for food during daylight hours. Orangutans eat mostly fruit, their favourites are huge spiky fruits called Durian.They also eat some flowers, honey, bark, leaves and insects. Wild orangutans have more than 300 types of fruit available to them in their rain forest home. They can produce a wide range of sounds (13-15) for communication. Their mornings and afternoons are spent foraging for these food items, with naptime during the midday’s heat. Orangutans are greatly camouflaged in rainforests because of the little sunlight that filters through the dense canopy reflects green light and absorbs the red-orange light that is similar to the color of the Orangutan’s coat. Orangutans have large home ranges, which may overlap. Each adult female usually lives in a stable home range of about 9 square kilometers (3.5 square miles). An adult male’s territory may be up to 39 square kilometers(15 square miles ). Orangutans are more solitary than other apes. Males are loners. As they move through the forest they make plenty of rumbling, howling calls to ensure that they stay out of each other’s way. The “long call” can be heard 2 kilometers (1.2 miles) away. Orangutans are very intelligent animals. They use tools like sticks to check depth of the water before entering. When mosquitoes bother them, they use branches to chase them away. When it rains or when sun is too strong, they will use large leaves to protect their heads. Orangutans can travel anywhere from 50 meters to 1,000 meters in one day. When orangutans stretch their arms, distance between toes on their left and right arms is 7-8 feet, which is greater than human height. Adult male orangutans develop cheek pads, which frame their faces and make their heads look larger. In captivity, males as young as 13 develop cheek pads, but in the wild, some males may not grow them until the age of 30. Once a male has his cheek pads, he won’t tolerate any other adult males in his vicinity and competes with them for access to receptive females. They live in the trees to avoid predators like tigers or leopards that hunt on the ground. Orangutan males are ready to mate when they are approximately 15 years of age. For girls it is about 12 years of age. Females only give birth every seven to nine years, and their gestation period is about 9 months. Orangutans have one baby at a time very rarely two. Newborns have pink faces that change to dark brown or black as they age, and look adorable, with tufts of hair that stand straight up. Orangutans are the largest arboreal mammals (animals that spend their life in the trees). They can move quickly from one branch to another. Also they can spend a lot of time by holding the branch with one arm when they consume fruit or leaves. Baby orangutans rely on mama’s nurturing for everything. They’re always clutching tightly onto the hair of their mother’s stomach regions. They do this all day long as their mothers go about their normal business, such as looking for sustenance. A four-to five-year-old orangutan moves around independently of mother but doesn’t go far, because it’s still nursing. Young orangutans may nurse for up to seven years. They are usually 3.5-4.5 feet tall and weigh between 110-200 pounds. Sometimes several mothers and their young encounter each other by a fruit tree within their overlapping ranges. They peacefully feed together and watch their youngsters play. Orangutan youngsters will stay with their mothers for some 7 or 8 years until they develop the skills to survive on their own. Researchers have identified at least 32 orangutan vocalizations. The “kiss-squeak” expresses excitement or fear.A “grumph” sounds like a belch and is a sign of disturbance or annoyance. Mothers warn their babies to stay close by making a soft, scraping sound. Orangutans communicate play, submission, aggression, fear, and worry through touch, facial expressions, and gestures. Orangutans are one of our closest relatives. They have 32 teeth, like humans and their pregnancy lasts 9 months, just like in women. Orangutans are born with an ability to reason and think. This large, gentle red ape is one of humankind’s closest relatives, sharing nearly 97% of the same DNA. The strength of Orangutans is believed to be 7 times greater than Human strength. Orangutans possess 32 teeth, the same number present in Humans. 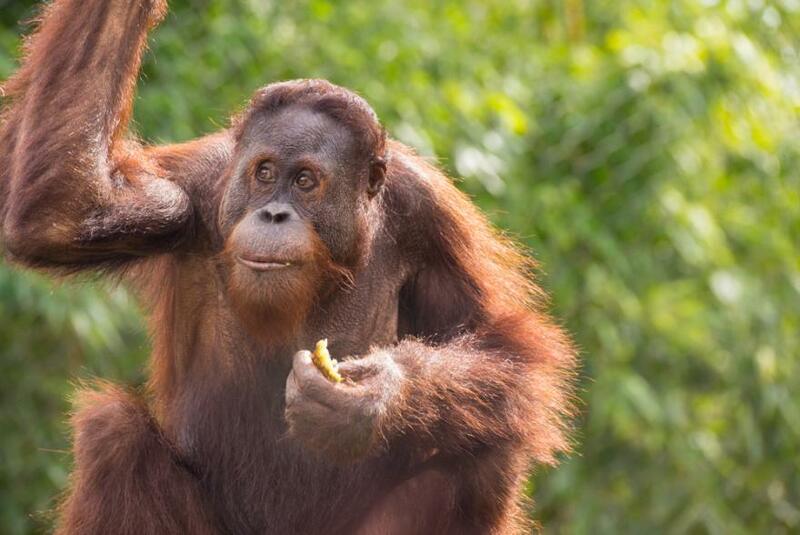 Like humans, orangutans have opposable thumbs. Their big toes are also opposable. Orangutans are also known as "Red Apes" because of their red coat. On Sumatra, the orangutan’s main predators, or natural enemies, are tigers and leopards. Tigers are very rare, however, because people have killed most of them off. On Borneo, there are no tigers, and leopards are only predator. On either island, young orangutans are much more likely to be eaten by a predator than are adult orangutans. Both orangutan species are considered to be Endangered, with the Sumatran orangutan being Critically Endangered. Human activities have caused severe declines in the populations and ranges of both species. Threats to wild orangutan populations include poaching, habitat destruction, and the illegal pet trade. Their dense forest home makes it difficult to determine population sizes, but the Bornean orangutan is estimated to number around 54,000 individuals, while there are around 6,600 Sumatran orangutans. A century ago, there were probably 230,000 orangutans – around four times as many as there are today. In prehistoric times, orangutans lived throughout Asia– roaming as far north as China. Bornean and Sumatran orangutans can breed together in captivity, producing viable offspring. So many Bornean/Sumatran crosses were once present in American zoos (before such breeding was banned) that there were more crosses in captivity than “pure” Bornean orangutans. Local Indonesian mythology has it that orangutans actually have the ability to speak, but choose not to, fearing they would be forced to work if were they ever caught.